We recently tweeted about a Guardian piece (I’m the only trip-hop artist in Palestine! The musicians shaking up the occupied territories, April 12th) so full of errors and wild accusations that editors took the unusual step of completely removing it “pending review”. We had emailed editors to complain about several errors – including erroneous Palestinian unemployment statistics and a claim that IDF engages in “summary killings” – but the most egregiously inaccurate claim we noticed can be seen this subsequent UKMW tweet. This morning we saw that the article was restored, with an addendum at the bottom stating that it was “amended to correct and clarify details”. However, whilst the highly inflated PA unemployment stats were removed entirely, and “summary killings” was changed to “killings”, they failed to correct the most bizarre suggestion, that (putatively “unscalable”!) 8 metre high concrete walls surround Haifa! We contacted editors again this morning, asking for a correction. We’ll keep you posted. 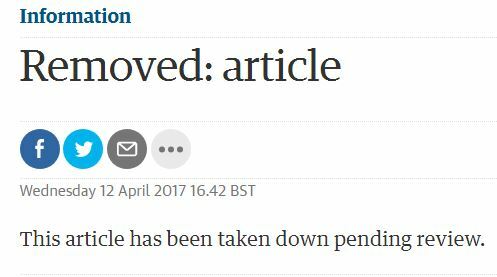 UPDATE: The article was finally corrected on April 18th. Luckily I read the article about the wall surrounding Haifa so I’ll be prepared when going to work there next week. I bought a new ladder – the shop attendant suggested a six meter high type but knowing the exact height of the wall I insisted and bought the ten meter high version. Next in the Guardian: – a tear-inducing report on the opening of the new shop in Tel Aviv selling the blood of Christian children for Jews celebrating Passover according to our well known traditions. 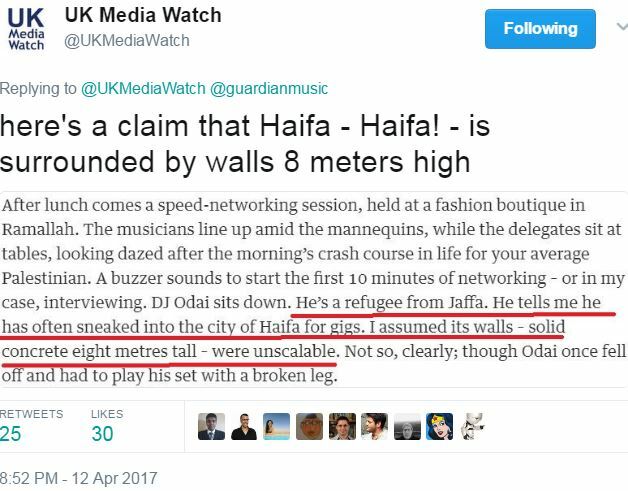 Leaving the obvious lie about the Haifa wall in the corrected version they just proved the fact that nazi-style smears don’t need to have even the slightest connection to reality, their readers will gobble up anything. I have been saying for many years that the Guardian is published by lunatics for idiots. No further proof is needed. A mistake. The publishers are not lunatics and the readers are not idiots – they are Jew-hating individuals supporting, promoting and aiding and abetting genocide. Wrong. One can be a Jew-hating lunatic (Jew-haters are by definition not quite right in the head), and one can be a Jew-hating idiot who buys all kinds of obvious fabrications. Might somebody send Banksy to paint a mural on the Haifa wall? He’d do less harm than most other things he’d do if he were to spend a few weeks looking for it. Banksy should be denied a visa to Israel (and to all civilised countries). This is a correction that doesn’t need to be made. The article’s argument is weak enough but leaving this mistake in is enough to sink it and the Guardian. It should have been left alone to serve as a permanent point of ridicule. Do you really want all those Brits coming and finding fault with everything?